While, yes, we all know that seeing the first-ever picture of a black hole is a freakin’ awesome landmark for science, I can’t believe we’re not talking about the equally exciting news coming out of Austin, Texas Thursday. We’re landing queso on the moon! The Falcon is carrying a moon lander from commercial space exploration outfit SpaceIL, which in turn is carrying the Lunar Library from the Arch Mission Foundation. The physical archive is comprised of millions of documents laser etched in microscopic analog form on a radiation-proof nickel Nanofiche™ disk. What was on this mysterious letter? Why, nothing less than the most mouth-watering queso recipe your taste buds will ever have the delight of experiencing. This never-before-published recipe is from local Austin diner chain Kerbey Lane Cafe, a restaurant so good that I demanded it be the site of both my pre-wedding brunch and my post-wedding breakfast. Their signature queso, named after the restaurant, features an incredible blend of melty cheese, cool guacamole, and pico de gallo. It is easily one of the top three best things you’ll ever put in your mouth. That recipe—that delicious recipe that the restaurant refuses to publish so that those of us who no longer have the fortune of living in Austin have to keep traveling back down south for one more taste—will be settling into its new home on the moon today. And it’ll be stored there in equal importance alongside a full copy of the English language Wikipedia, 25,000 books, and a guide to thousands of languages, so that future intergalactic citizens (i.e. aliens) will be able to create this delicious culinary landmark for themselves. Plenty of people—including both my husband and Kerbey Lane Cafe CEO Mason Ayer—have pointed out that sending the recipe is one thing, but getting the actual ingredients to space is a whole different story. However, as we all learned through Wallace and Gromit, the moon is in fact made of cheese, so sending a recipe to transform it into something even more delicious only makes sense. We choose to send queso to the Moon - and maybe someday chips as well, not because these things are easy, but because they are hard. The challenge to eat queso in zero gravity is one that we are willing to accept, one we are unwilling to postpone, and one we intend to win, among other key challenges, like next time remembering the chips. The full letter can be found here. It’s almost as good as Kerbey queso. 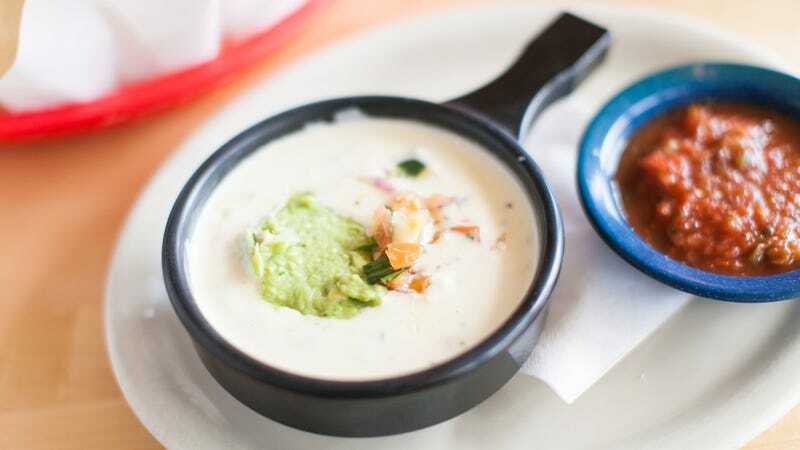 And for those of you who do live in Austin: Kerbey Lane is giving away free queso to all dine-in guests today. We live in a truly beautiful time.